It is an increasingly popular design trend to expose old brick walls hidden behind layers of plaster/lathe or drywall. Double brick and triple brick homes typically have brick interior walls that can be exposed and transformed into beautiful focal points. To expose an interior brick wall, the plaster is completely removed before bricks are cleaned, refinished and coated with sealant. Our clients commonly ask us if their older Toronto home has interior brick walls just waiting to be uncovered. 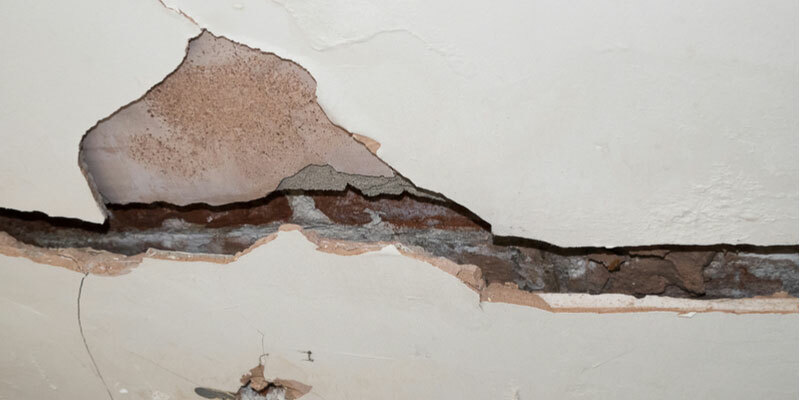 While we can make a highly-educated guess, you never know for certain what’s behind plaster until you remove it—and we’ve seen some wild surprises. In some cases, there’s brick but it’s not always the perfect looking brick you’re picturing. A lot of the time, interior brick is downright ugly. Understandably, the builder saved the best brick for the exterior of the home and used less attractive brick for areas no one would see, or so they thought, until you came along and tore the plaster off interior walls. It’s not uncommon for people to remove plaster and then discover they hate the brick and want to cover it back up. Still, others find interior brick that looks similar or even better than the brick on the exterior of their building. If you hate the look of your natural interior bricks, at least there are options for stains, paint, etc. The first step to uncover if your home has hidden brick interior walls is to identify the type of structure: is it double brick, brick veneer or triple brick? What is a Double Brick/Triple Brick Home? Double brick and triple brick represent full brick houses. Brick is holding the house up and therefore can be found on both exterior and interior walls. If you live in a double brick house more than likely you’ll find brick beneath plaster. Double brick row homes have a lower chance of shared brick walls. Exposing certain brick walls can take away necessary insulation, and to begin with, double brick homes are usually less insulated than brick veneer homes. Plus, if your home is attached, you might be able to hear your neighbor’s dinner conversations once the plaster is removed. That’s why it’s more common to remove plaster from interior walls that don’t need to provide insulation or as much sound barrier. Look at the outside of your home and study the bricks—are they all the same? Or around every 6 rows of brick do you see header bricks, or a row of bricks facing in a different direction? Header bricks are used to stabilize buildings made of solid brick, hence how they can help you to identify if your home is made of double or triple brick. What is a Brick Veneer Home? Brick veneer is 100% real brick, it just doesn’t hold up the structure of the home. Veneer buildings are constructed from wood framing with a layer of brick applied to the outside for aesthetics. A brick veneer house will not have interior brick walls, so please, don’t blast away your wall plaster! The frame, which is made of wood or steel and stands as the main structure and support of the building and its roof. The masonry veneer is for show and virtually only supports itself, with help from the main structure. Masonry is secured to the structure of the home using ties and nails. This provides stability and weatherproof protection. Finding an old brick wall hidden between the walls of your home is exciting, but adding a brick wall gives you more options regarding color of brick, type of brick, style, etc. If you really want a brick interior wall, you can make one yourself by adding bricks to just about any wall—inside or out. Just like a brick veneer house has bricks applied to its exterior, the same thing can be done to the inner walls of your home. A layer of veneer bricks can be applied to any wall covered in drywall or plaster.